William Mellor was a British Victorian artist who was born in Barnsley in 1851. Not much is know of his early life and he never exhibited his works in London; but his paintings have become a favorite among Victorian landscape collectors. 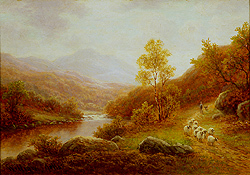 Mellor lived in Yorkshire, specializing in landscape paintings featuring views in North Wales and the West Country. 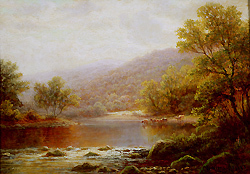 His most sought after works are that feature the unspoiled landscape of England bathed in a warm, luminous, light. During the late 1880s through the turn of the century (c.1908) he was living in Manchester and he exhibited 5 works at the Walker Art Gallery, Liverpool and 4 works at the Manchester City Art Gallery. An interesting feature about his works is the fact that he often inscribed them with the exact location.